What's a Party without Buffalo wings! Try my new Honey Lime buffalo wings, or my already famous wing recipe and make your next get together extra special! 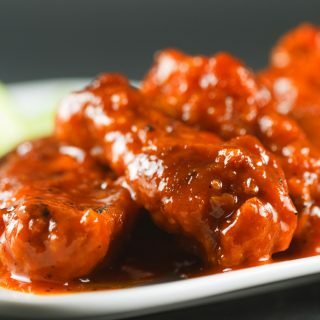 It’s party time with Honey Lime Buffalo Wings. Now as everyone knows I do make some killer buffalo wings, they have even achieved legendary status at the Mount where I truly believe If I served them every day they would eat them. My girls love their hot sauce! And there my friends lies the secret in making great buffalo wings, its the sauce. I have to admit while I was a little excited to try a new flavor hot sauce, I was also a little reluctant to forgo my original perfected sauce. But change is good, and just in case it wasn’t good I wanted an opportunity to try it out on just Lisa and myself before I served it to my guests on Superbowl Sunday. The first thing I noticed was that the sauce did not cling quite as well, and it just didn’t seem to thicken the way I was used to. The lime flavor was interesting, but not really what I was looking for in my hot wings, although I know a few of my friends would love them with that hint of lime flavor. 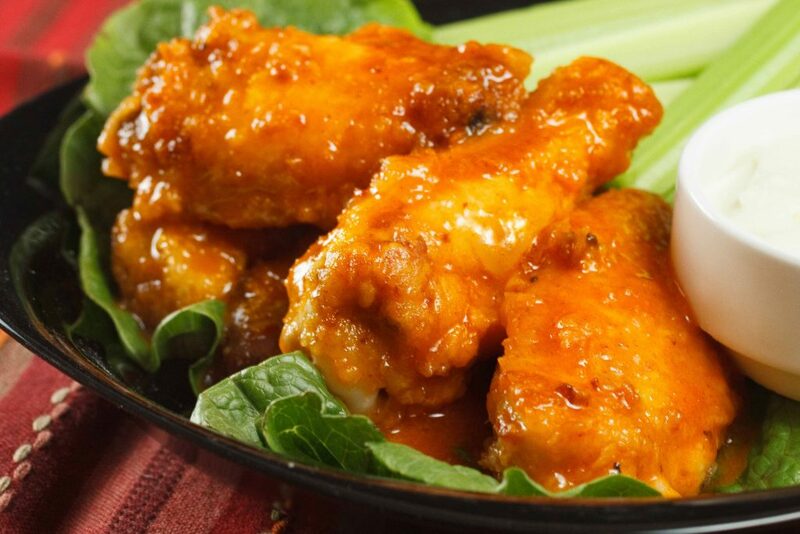 Now if you’re looking for the Best Buffalo Wings you’ll ever have, then give this recipe a try and make sure to use Franks Buffalo Sauce to start with, I promise you won’t be disappointed, of course, if you like your wings on the Atomic Heat Scale, feel free to add additional hot sauce to the recipe! If you’ve tried my Honey Lime Buffalo Wings or any other recipe on askchefdennis.com please don’t forget to rate the recipe and let me know where you found it in the comments below, I love hearing from you! You can also FOLLOW ME on Instagram @chefdenniseats and @chefdennistravels, Twitter and Facebook. dredge the wings in the flour to get a good coating on the wings. Repeat process until all the wings have been cooked. In a food processor, add the sour cream or Greek yogurt, the milk and half of your bleu cheese. Pulse the mixture until all of the bleu cheese has been blended in. You should make this dressing at least one day ahead of time, to let the flavors build, but you can use it right away if you need to. 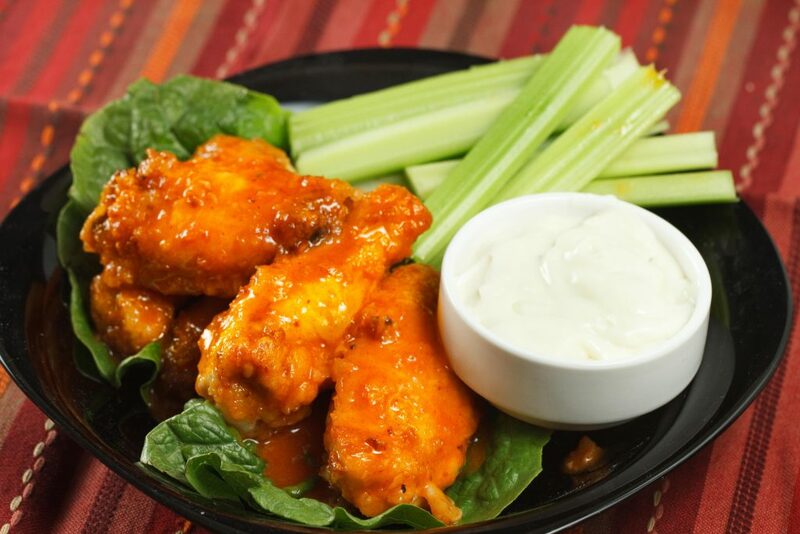 Toss the wings in a stainless steel bowl with your prepared sauce until well coated and serve immediately with blue cheese dressing and celery sticks! *For the recipe if you are making more wings the ratio is 2 parts hot sauce, 1 part butter, and 1/2 part honey, this amount of hot sauce will do about 48 pieces of wings. The Most Ah-Mazing Buffalo Chicken Wings You’ll Ever Make! 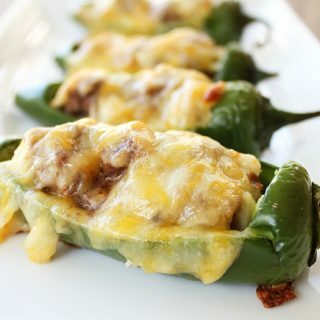 Cheesy Stuffed Jalapeno Peppers – Lets bring the heat! No superbowl out this way, but I’d go for spicy lime wings any day! 🙂 A. The wings look good, sorry they didn’t turn out the way you like them. I do a similar sauce as you, but I like to add a bit of garlic and some sriracha to mine. That and I like to grill them in my Big Green Egg. those sound incredible! I like grilling mine too, they just don’t get as crunchy that way. My original recipe is the best, the lime version is a nice change, but you’ll always go back to the original, or my famous as my girls call it! Dennis, if I ate wings and wasn’t vegetarian I would be all over these ;)! They sound wonderful, and honey lime is such a great combination! Congrats on the Top 9, well deserved :)! You can’t watch the superbowl w/o wings! These look amazing! Congrat’s again on the top 9. I see your face there frequently and with what I see in your recipes it’s well deserved. I am a BIG Cholula fan but have never tried it in a wing sauce. Frank’s is my all time go to for buffalo wings because it has great pepper flavor and low heat comparatively. I’m with you also on the whole “change” thing (reluctant as I am) But I try not to break things that aren’t broken and great buffalo wings are a beautiful thing! Congrat’s again! Nom nom nom…we love Cholula. Bet Cholula Lime rocks it! Great combo of flavors for these wings. They look perfect! These are perfect for the superbowl party. I wish I could have some for lunch today. Just so pretty. Congrats on Foodbuzz top 9 today! Now those are some wings! 🙂 Looks delicious, and I bet there’s a great balance between the honey sweetness and the lime zing. PS. Congrats on the Top 9! yummm wings are my favorite! and just in time for the super bowl thanks! You cannot beat homemade buffalo sauce. My husband makes the best and I won’t eat anything at restaurants any more. Right now we have to take a break for some health issues on his side. It would be a bit cruel to have it around when he cannot eat the hot stuff. Rest assured though once he is back up to par we will be trying out this recipe. These wings look DIVINE!! The only reason to attend a Superbowl party is for wings! Where can I buy Franks hot sauce? I agree it is all in the sauce. You’ve been BUZZED. They sell it everywhere in the states but I’m thinking your somewhere else. You’ll just have to wing it (pardon the pun) with the sauce, and type of flavorful tobasco sauce will work, the reason I like franks is it has a few other ingredients that make it tasty and not just hot. let me know if you make them. 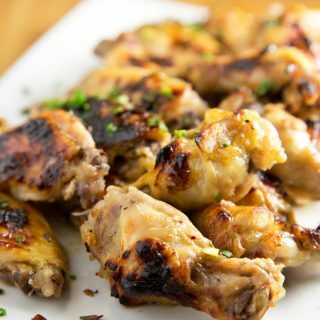 What a great flavor combination for chicken wings, these looks delicious! Looking forward to game day we always make loads of wings, this recipe is a definite! I just forwarded your link to my husband because he LOVES wings, he LOVES cholula and he LOVES perfecting his recipe. Thanks so much for this! I have a very good feeling that we will be making wings on super bowl Sunday now..
With wings, you are absolutely right, it is all about the sauce. I use franks in my buffalo sauce! So are you gonna watch the game? Who are you cheering for? absolutely I will be watching the game…it’s been a long dry spell for my Cowboys…sigh, I will be rooting for the underdog Giants, Brady has enough rings already! I made the original version of these wings (not the honey lime) for the Super Bowl last year and they were a huge hit! They were my first attempt at making homemade buffalo wings and only found the recipe by browsing through google. I never saved the recipe, and I’m so glad I was just able to find it again because I am definitely making them again. 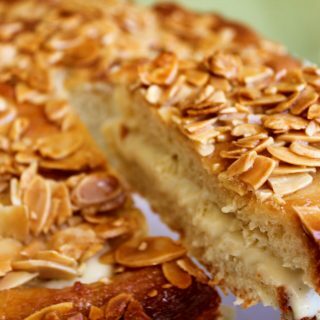 They are so good and not hard to make…you all need to try them! I’m glad you enjoyed my sauce, it really is tasty! I think that’s why I didn’t enjoy the honey lime as much, its just hard to beat that sauce! Honey & Lime is such a fantastic flavor combination! I bet this tastes incredible… I would love to try this recipe out… Thank you, Chef Dennis! As it happens I am looking for a great wing sauce so this will be tried soon. They also look as good as they sound. Stay with the regular recipe and I promise you won’t be disappointed. It’s not super hot so if you like really hot food you might want to crank it up just a bit more. These wings look fabulous. I am hosting a Superbowl party (go Pats!) and am looking for a good wing recipe. Well done. It still looks pretty darn delicious! And love your blue cheese sauce recipe! Delicious, game or no game! 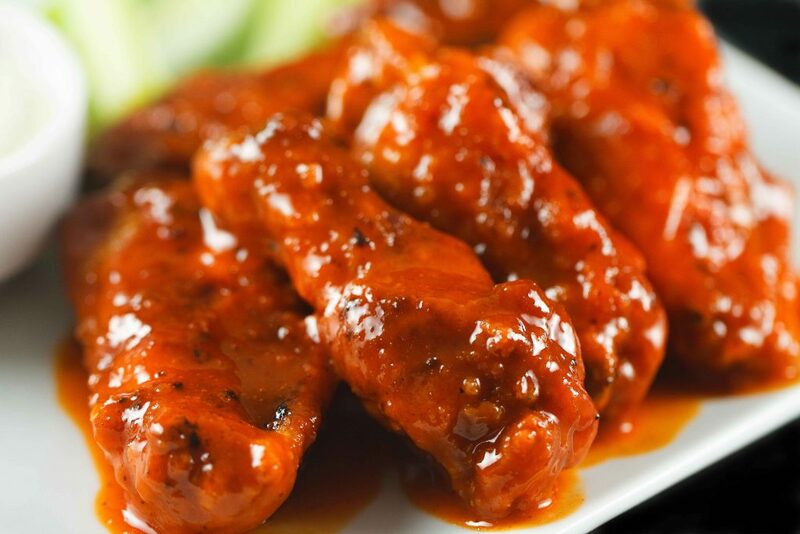 Like you, I do want my wings to have a thick sauce. If it doesn’t stick, it might as well be a dipping sauce. I love trying new wing recipes, so I am adding this one to the group. Looking forward to hearing more about the new venture! I love exciting news! And while I’m a hot sauce wuss, my husband would love these wings and so would everyone else at our Super Bowl party 🙂 Definitely another hit! OMG! 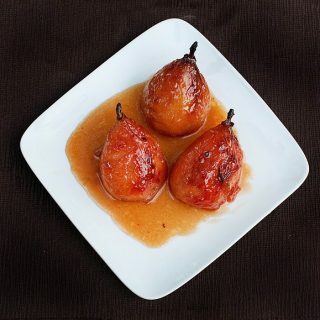 I was craving something like these, I came to the pc to search any recipe online and you had the response just here at my desktop, I felt like you could read my mind, thanks! Dennis, these look and sound awesome, hubby will love these! Pinning! I can’t even begin to tell you how many times my Hubby asked me to make him hot wings.. It’s one of those intimidating things to me. I will try your recipe – so fingers crossed! Thank you so much, Chef! They’re really not difficult Anna, but I would recommend the original recipe using Franks Buffalo Sauce instead of the honey lime, he will devour them! What a bummer that the the sauce didn’t turn out as you hoped and expected. I love wings and would be very disappointed. Looks are deceiving though because the appear absolutely delicious (and your blue cheese dressing sounds amazing). they were good, not just not as good as my regular recipe, you can see how the sauce just looks thicker and richer….but we still ate them all! !